Althea Gibson is noted not only for her exceptional abilities as a tennis player, but for breaking the color barrier in the 1950s as the first African American to compete in national and international tennis. Althea Gibson was born in Silver, South Carolina, on August 25, 1927. She was the first of Daniel and Anna Washington Gibson's five children. Her parents worked on a cotton farm, but when she was three years old the family moved north to the Harlem area of New York City. Gibson caused a lot of problems as a child and often missed school. Her father was very strict with her on these occasions, but he also taught her to box, a skill that he figured would come in handy in the rough neighborhood the Gibson family lived in. When Gibson was ten years old, she became involved with the Police Athletic League (PAL) movement known as "play streets." PAL was an attempt to help troubled children establish work habits they would need later in life. In 1940 PAL promoted paddle ball (a game similar to handball except that it is played using a wooden racket) competitions in Harlem. After three summers of playing the game Gibson was so good that the Cosmopolitan Tennis Club sponsored her to learn the game of tennis and proper social behavior. In 1942 Gibson began winning tournaments sponsored by the American Tennis Association (ATA), the African American version of the United States Lawn Tennis Association (USLTA). In 1944 and 1945 Gibson won the ATA National Junior Championships. In 1946 several politically minded African Americans identified Gibson as having the talent to help break down organized racism (unequal treatment based on race) in the United States. Sponsored by Hubert Eaton and Walter Johnson (1887–1946) and inspired by boxer Sugar Ray Robinson (1921–1989), Gibson was soon winning every event on the ATA schedule. In 1949 she entered A&M University in Tallahassee, Florida, on a tennis scholarship and prepared for the difficult task of breaking the color barrier in tournament tennis. The USLTA finally allowed Gibson to play in the 1950 Nationals when four-time U.S. singles and doubles (a two-person team) champion Alice Marble (1913–) spoke out on her behalf. Gibson lost her first match of the tournament, but the breakthrough had been made. Over the next several years Gibson worked as a physical education teacher at Lincoln University in Jefferson City, Missouri. She also continued playing tennis and rose up the USLTA rankings (ninth in 1952, seventh in 1953). After a year of touring the world and playing special events for the U.S. State Department, Gibson staged a full-scale assault on the tennis world in 1956. That year she won the French Open in both singles and doubles. Over the next two years Gibson was the leading women's tennis player in the world. In 1957 and 1958 she won both the Wimbledon and U.S. National singles titles, becoming the first African American to win a Wimbledon singles title. In 1958 she wrote a book about her life called I Always Wanted to Be Somebody. After her 1958 victory at the U.S. Nationals, Gibson retired from tennis and played professional golf. She was elected to the International Tennis Hall of Fame in 1971.
cereal box as part of a special Black History Month package. Later that year tennis stars Venus (1980–) and Serena Williams (1981–) were honored at an Althea Gibson Foundation dinner that raised $100,000 for scholarships and youth development programs. Through a spokeswoman, Gibson congratulated the Williams sisters for having grown into two of the best tennis players in the world. Biracree, Tom. 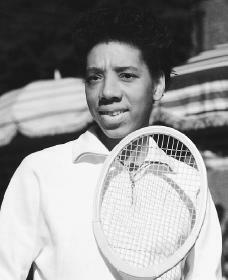 Althea Gibson. New York: Chelsea House, 1989. Davidson, Sue. Changing the Game. Seattle, WA: Seal Press, 1997. Gibson, Althea. I Always Wanted to Be Somebody. Edited by Ed Fitzgerald. New York: Harper, 1958. Jones, Betty Millsaps. Wonder Women of Sports. New York: Random House, 1981. Althea Gibson was a phenomenal woman. Not only was she a champion tennis player, but she performed all of her stupendous sports feats while laboring under extreme duress. I cannot imagine functioning positively in front of hundreds of fan knowing I couldn't use the same facilities. She didn't just pave the way for others. She literally chopped the way through the jungle with a small machete. We cannot thank her enough.